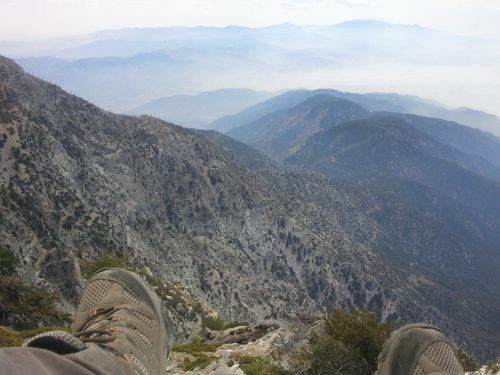 Over the weekend, I was able to get out and climb Cucamonga Peak in the San Gabriel mountains. It was a 12-mile round trip with a 3800-ft elevation gain. If you’re looking for a detailed trip report with great directions and stunning photos, then, as always, I direct you to a post from the Modern Hiker. 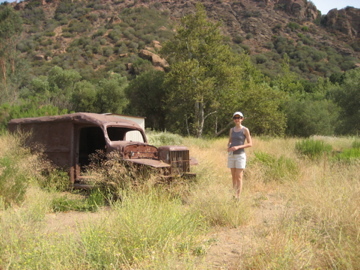 I did, however, manage to grab a great spot for lunch — staring down an abrupt slide into the Cucamonga wilderness area. The high peak in the distance is San Gorgonio; the boots in the foreground are mine. Not pictured is a panorama of Mt. Baldy directly behind me.